In September 2007, the Northwest Passage was ice-free for the first time since satellite records began. The passage is a direct route from Europe to Asia for ships traveling through the Arctic. Long perceived as low-level courses with little to engage or challenge students, Earth and environmental science classes are now becoming vital, rich, invigorating courses. As more people recognize that our planet's resources may not be able to keep up with demand, these classes are receiving more interest and they are being taught as true laboratory science courses. Grove Karl Gilbert spent a week in Utah’s Henry Mountains in 1875 and a month in 1876, emerging with notebooks filled with notes, including, bottom right, his drawing presenting a revised hypothesis for the formation of the mountains. As scientists, we "do" science every day. We talk with colleagues, read papers, mentor students, look at data, and try to make sense of it. The "process of science" is so ingrained, it's easy to forget that our students don't yet know what the process is or have the ability to think and reason as we do. Geoscience teachers, particularly those teaching introductory courses, can find many specific activities and the basics of many "active-learning" teaching methods on the Starting Point. The site's creators and contributors knew that new teachers of geoscience typically teach introductory courses — and that these are some of the most challenging courses to design and teach, because of their size, range in student motivation and background, and other factors. A newly hired instructor, charged with planning labs on rocks and minerals for sections of a large introductory geoscience, for instance, may wonder "Are there ways to use the campus as a learning site for my students?" "How can I make a three-hour lab on rocks and minerals exciting for my students?" "I've heard of 'just-in-time teaching,' but what is it and how can I use it with my students?" The beauty of Starting Point is that instructors can find information on both content (including ideas for activities) and on the teaching methods that work particularly well with those activities and that content. Are you looking to invigorate your teaching this Fall by engaging your students in active learning? The Science Education Resource Center (SERC) website hosts collections of teaching materials and professional development resources that can aid in this endeavor. Materials include teaching activities, course descriptions, and information on pedagogic methods from more than fifty projects. The materials span many disciplines and can be used wholesale or modified to fit your classroom. Resources are available for all levels of education, whether you're a K-12 teacher, 2YC, college, or university educator, or involved with public outreach. One the Cutting Edge (CE), a professional development program for the geoscience community, has been active since 2002. Since its beginning, CE has used a two-pronged approach to expand the use of discipline-based education research in undergraduate geoscience classrooms. Many geoscience faculty have participated in an array of CE in-person and/or virtual workshops on subjects related to the methods and processes of teaching and learning (e.g., Course Design, Teaching in the Field, Metacognition) as well as content-focused themes on a range of topics from biocomplexity to structural geology. In addition to the well-received workshop program, CE has developed a series of related websites to support both workshop participants and the greater geoscience community. Tens of thousands of people from around the world visit the award-winning site each week to examine thousands of webpages that are home to undergraduate activities submitted by workshop participants and others. Students add weights until the party popper initiates. 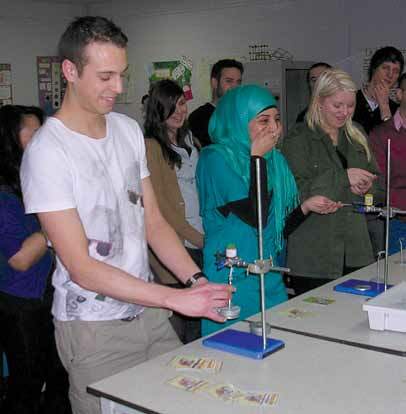 Note the reaction of the student in the middle of the photograph, who is a pre-service science teacher. Looking for tested activities to fire up your teaching of Earth Science? Visit the Earthlearningidea website that was founded in 2008 as part of the International Year of Planet Earth initiative. More than 160 activities are already published on the website, with a new one added every two weeks. Using maps in the classroom invites curiosity, encourages exploration and inspires problem solving. Maps can be used to explore a multitude of topics and can incorporate visual learning, spatial thinking and quantitative skills into a lesson. 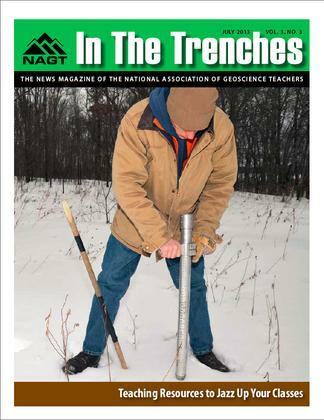 In support of AGI's Earth Science Week, NAGT sponsored the development of this collection of resources to help K-12 geoscience teachers engage their students with maps. Mars for Earthlings seeks to expose undergraduate students to planetary study through Mars remote sensing data and Earth-based analogs. Through this resource educators can access learning modules to integrate into earth science classes. Interviews and thoughts from planetary scientists and geologists will present current issues in planetary sciences. Higher education must lead the way in preparing learners for citizenship in a world where the complex issues of sustainability—environmental quality, community health and wellbeing, and social equity and justice—are paramount. Curriculum for the Bioregion engages faculty communities in exploring these issues and in building sustainability concepts and place-based learning in a wide array of courses and disciplines. This project has developed activities that incorporate sustainability concepts and place-based learning, introductory courses that feature sustainability themes, and essays on bioregional teaching and learning and the pedagogies of teaching for a sustainable future.